I have tried chole recipes from cookbooks and a few from the internet. Nothing really made me happy. The chickpeas were either hard or the gravy turned out tangy. Anyways I tweaked my recipe for pindi chole that’s posted here and followed some tips shared by a friend of mine long back to make this delicious chole masala recipe. You will find most of the ingredients for this recipe in your pantry. It doesn’t call for store-bought chole masala powder like most of the recipes online and it tastes great even without anardana / pomegranate powder. Please do give this a try.This chole will go well with chapathi / naan/ bhatura / matar pulao/ jeera rice etc. I am sure you wont be disappointed. And please share your feedback if you liked it. I get super-excited when I get feedback from people who have tried out my recipes :). This post reminds me of one more thing. 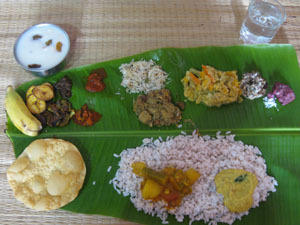 Many of you have asked me to share a menu (especially North-indian vegetarian) for potlucks and parties. I have listed some of my favorite vegetarian dishes below this post. You can try some of them for your next party. 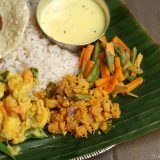 My most favorite vegetarian side-dishes for pulao posted here are chole, mixed vegetable subzi, mushroom butter masala, dal makhani and dhingri malai matar. I will share some more party specials soon. Hope you give them a try. 1. Pressure cook all the ingredients numbered 1 in a pressure cooker for 3 – 4 whistles or until soft. Open the cooker after the pressure releases or after 10 – 15 minutes. 2. Heat 1 tbsp ghee in a kadai to smoking point. Add this to the pressure-cooked chana. Cover with a lid and set aside. 3. Heat 2.5 tbsp oil in the same kadai. Add all the ingredients numbered 4. Saute until onion turns golden. Add pureed tomato and saute until oil separates. Add ingredients numbered 6 and cook for a minute. Add cooked chana along with the gravy (remove the tea bag) and 1 cup hot water. Bring to a boil. Set the heat to medium-low and cook covered for 15 – 20 minutes until the gravy becomes thick. (If the gravy is not thick enough, mash some of the chickpeas using the back of a spoon.) Add crushed kasoori methi and mix well. Cook for a minute and switch off. This will thicken a lot over time so adjust the gravy accordingly. Sprinkle some chopped cilantro, onion, thinly sliced ginger and serve hot. Chole masala goes well with bhatura/poori/roti/ naan/ pulao etc. Thanks a lot for trying my recipes and letting me know your feedback! Thank you Maya for Chole masala receipe!! hope I’ll be able to prepare with yummy taste!! God bless you dear!! Excellent and easy recipe! Made for dinner today! Thank you and keep the vegetarian recipes coming! It was really very tasty,as I am lucky enough to taste it from Maya’s kitchen I can tell people to go ahead and try it…My husband who is not a fan of vegetarian cuisine even he ate it like anything…Thanks Maya for sharing the recipe..
Hi Maya, Why do we have to add tea bag and baking soda? My family’s most favorite dish !